Editorial: Support of readers is awesome! 1. Reader wants paper to fail. End of Letters to the editor! Dreams should not be left to wind. Students enjoy pre-game and post-game events! Wolfpack sent back to caves in Orlando! During the second semester of my freshman year I decided to rush. Joining a sorority is a big deal to some girls when they first come to college, and to others it is looked down upon. For me, I was really not concerned with either view of the organizations. I had more important things to worry about, like getting a B on my Bio 2 test. 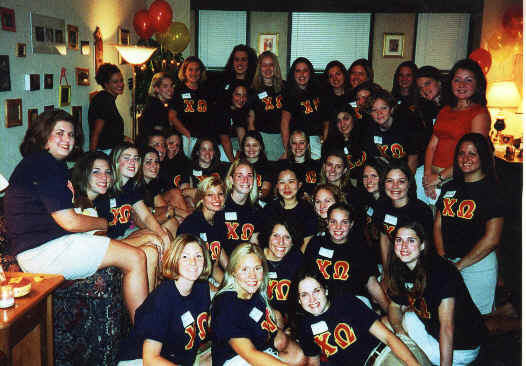 Travel with me back in time to experience why and how I joined Chi Omega. One day, I was sitting at Schenley Cafe having lunch with few friends who also were brothers at one of the Fraternities on campus. I mentioned that I was headed out to the rush events that night. They asked me where I was going and I proceeded to tell them. When I mentioned Chi Omega, both of them smiled and nodded. One remarked, "Chi O girls are cool. They are very down to earth, fun to hang out with." This made me think for a minute, I wasn’t sure if I was going there that night, but I decided to make it a stop. That night I walked off of the elevator into the suite. Girls were standing around dressed in black pants and bright colored shirts, smiles on all of their faces. The suite was dressed in cream and green colors; it was a very home-like atmosphere. A girl who proceeded to show me the way to a couch greeted me. We talked for a minute. Later, I was offered popcorn and a drink. Mostly everything was the same as the other sorority parties but I felt this place was different. The atmosphere was very welcoming and I felt completely comfortable and at home with every bit of my surroundings. Every sister that I talked to was very genuine and interesting. All of them were different from each other, but interacted as though they had so much in common. I specifically remember when a few girls said hi to me, using my name, recognizing me from "Meet the Greeks" earlier in the week. To know that I was not just a name on their list made me feel so much better. These girls had real things to talk about; the mention of boys and parties never hit the conversation once. Getting drunk was not the top priority on their list; contrary to my belief of what sororities were really about. I was told about the work they do with Family House, School for the Blind and the Greek activities such as Parent BBQ’s and Bigs & Littles. I spent a few days getting to know the sisters of Chi Omega, and I decided that I would love to be a part of what they do. I received my bid and began my journey as a pledge. I was basically thrown into a group of girls that I did not know at all. Little did I know that these girls would end up being some of my best friends! Now as a sister, I get to participate in rush from the other side. I get to meet girls from all different backgrounds. I get to tell them that being a sister isn’t about getting invited to the exclusive fraternity parties or being the top girls on campus. It’s what we refer to as sisterhood. We are a group of friends; we help each other out academically, in our personal lives, and in everyday life. I know that if I really need to talk about something, one of my sisters, if not all of them, are going to listen to me and do everything they possibly can to help me through my situation. There is always someone to eat with, always someone that has taken that Organic Chemistry class and knows what to do. I love each and every one of my sisters like they are blood, and realizing that I have friends that will do anything for me really helps me to be a more complete person. College is such a trying experience and Chi Omega is my support through that experience. Sorority sisters enjoy a time of bonding in their Amos Hall suite!